It’s easy to adapt the 5-sided Tarp 5 to the local environment, using trees as well as stakes to erect unique shelter shapes. The Hilleberg Tarp 5 is an unconventional, five-sided tarp that weighs 11.3 oz, including guylines and line tensioners. 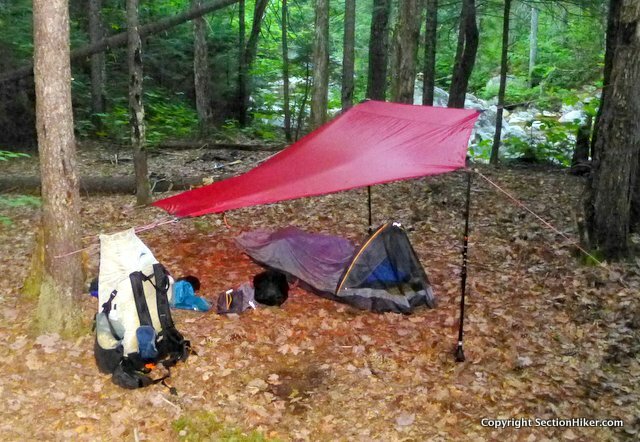 Most backpacking and hammock tarps are four-sided rectangles or six-sided hexagon shapes, so a five-sided tarp is a real departure from the norm. That’s not all that sets the Tarp 5 apart. In addition to its unusual shape, it’s made with a super-strong, tripled coated silnylon fabric that is three times more waterproof and substantially more tear resistant than most double-wall backpacking tents. The combination makes the Tarp 5 both dependable and unique to use, combining bomber durability, function, and elegance, the qualities that characterize many of Hilleberg’s other tents and shelter products. 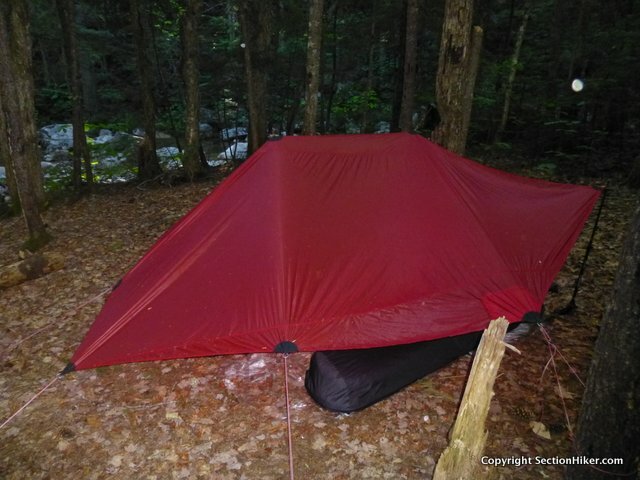 The five sided Tarp 5 is designed to be used by a single person as part of a complete tarp shelter system that includes a tarp, a waterproof sleeping bag cover or bivy that provides insect and rain-splatter protection (rain bouncing off the ground and under the tarp), and a groundsheet. The tarp’s function is to protect you from rain, sun, or wind, while providing a lightweight and well ventilated shelter, that’s more intimately connected to your surroundings than say a tent, which walls you off from it. Learning how to set up a tarp to optimize the degree of protection it provides is more difficult than a tent because the ends are open to the elements, whereas most tents can be set up any which-way without regard to their orientation, except in extremely windy conditions. Because of its unusual shape, it helps to look at a design spec of Tarp 5 to understand its unique properties and construction. While the Tarp 5 is 10.3 feet long and 7 feet wide, those dimensions are a little misleading because the tarp tapers from front to back and none of the corners is a right angle. The extra side wings on the Tarp 5 give the occupant more interior space and height, even when the tarp is staked to the ground in a storm-proof pitch designed to prevent wind-blown rain spray. 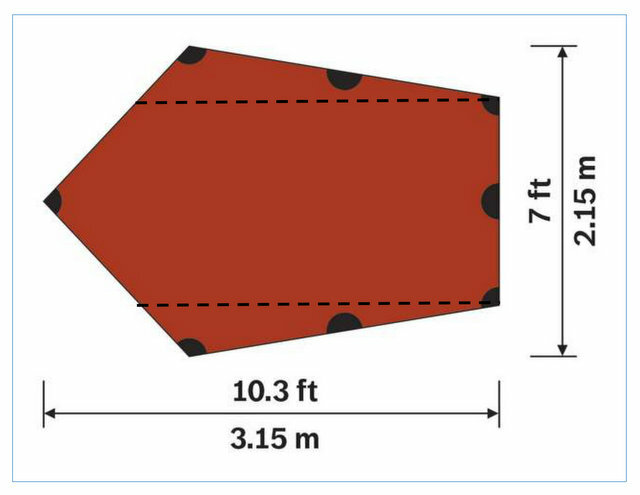 The dashes on the diagram represent the seams of extra material sewn to the sides of the Tarp 5, to give it more width than a rectangular symmetric tarp. You can see the seams and extra panels clearly in the photo above. While they increase the width of the tarp, they also make it possible to increase the interior height of the A-frame style pitch and improve interior livability. You do need to have poles that are long enough to take advantage of the added height, or a tree that you can secure the tarp to. The nice thing about this design is that Tarp 5 doesn’t have a center seam, like most other tarps, so there’s no seam sealing required. What about the seams for the extra side panels? I wouldn’t bother sealing them. 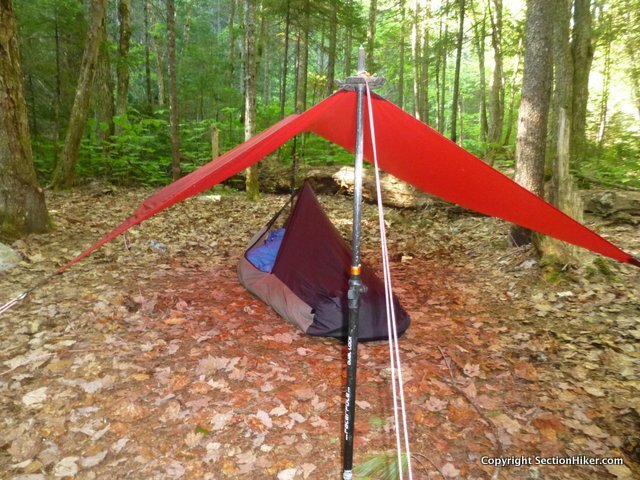 If you’re in a howling gale, you’ll probably pitch the tarp in an A-frame configuration, with the side panels more vertical than normal, and staked directly to the ground. If they were to leak, they’re not going to leak on you, since you’ll be under the tarp’s center line. But the spec diagram obscures an important dimension of this tarp, something that I’d call the “effective length” or “effective rain barrier.” In reality, the effective length of the Tarp 5 is more like 7′ 10″, which is the length of the dashed lines, above. For example, if it were blowing rain against the side of the tarp (top of the diagram), you’d have a barrier 7′ 10″ long to hide behind to avoid getting wet. 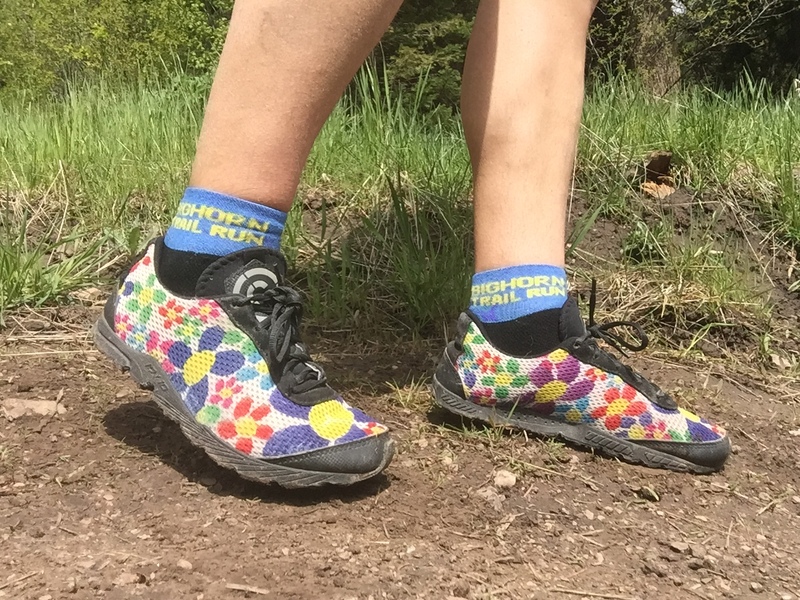 If you’re under 6′ in height, that’s a manageable length to avoid any rain coming in at the open ends. But it is borderline “short” for a tarp and you might have to rely on your waterproof sleeping bag cover/bivy to carry more of the burden of keeping you dry than the tarp alone. Even more so, if you’re taller than 6′. Learning how to position a tarp to minimize the effect of oncoming weather, together with good campsite selection, can help mitigate the impact of bad weather, but requires experience to learn. That bumps up the skill level required to use this tarp, making it less suitable for beginners. Don’t write this tarp off, though. It has other qualities that are unique and highly desirable. All of the guyout points are reinforced and come with pre-installed metal rings, guylines, and adjustable tensioners. 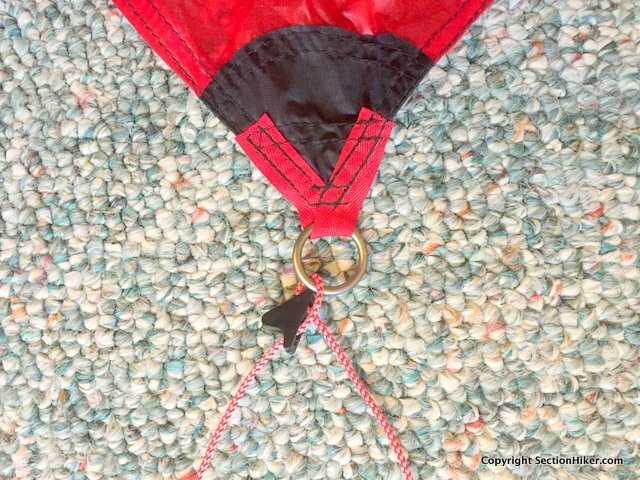 One of the things that sets the Tarp 5 off from other tarps is the quality of its manufacture. At 11.3 oz, this is a pretty lightweight tarp, even though it’s made with silnylon. But the silnylon that Hilleberg uses is vastly superior to the silnylon used by other manufacturers. It’s triple-coated with a hydrostatic head of 5000 mm. That’s over three times more waterproof than most lightweight double wall tents, which have a hydrostatic head of 1200-1500 mm. 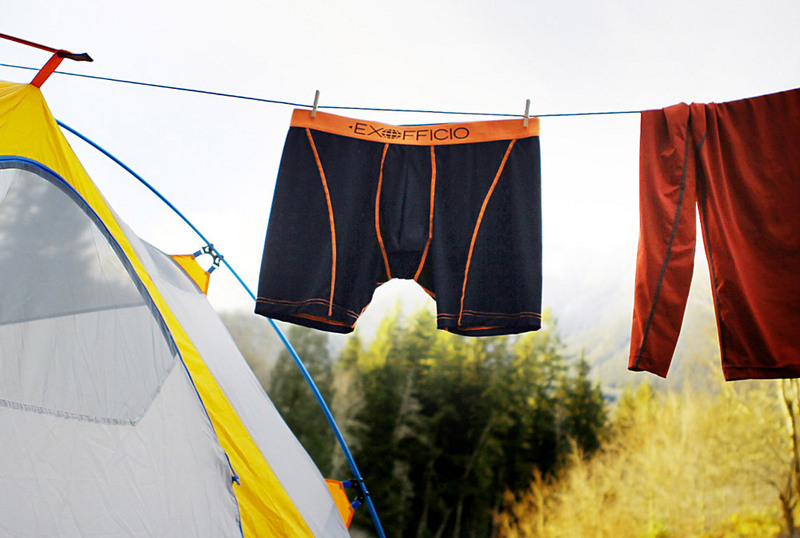 So you don’t have to worry about wind-blown rain being forced through the Tarp 5 fabric. The same fabric, which Hilleberg calls Kerlon 1000 (read more at Hilleberg.com), also has a high tear strength so you don’t have to worry about a microburst blasting through the roof. The same can’t be said for a UFO landing top of the tarp, but no one makes a fabric that strong yet. These ultra-durable fabrics are what makes Hilleberg tents so much stronger and wind-worthy than other tents and more expensive. 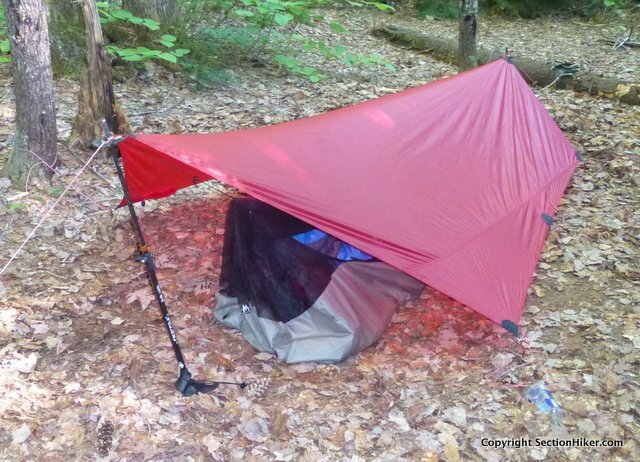 Although the Tarp 5 is quite inexpensive at $160, all things considered. All of the guy out points on the Tarp 5 are reinforced and have pre-attached metal rings that fit over most trekking poles tips, including Pacerpole tips. This makes trekking pole pitches super easy to put up. The Tarp 5 comes with pre-installed reflective guylines and tensioners. The guylines are 6′ long, which is perfect for a wide range of pitching needs. The tensioners are easy to use, but are more oriented to trekking pole pitches using tent stakes. They can still be used to tension the guylines when tied to trees, but you’ll want to learn some easy friction knots to anchor the free end. If you don’t like the guylines or tensioners, they’re easy enough to replace. After using them for a while, I think they’re actually the best option for mixed use. The center guyouts (where the ridgeline would be if the tarp had a center seam) are color coded with red stripes to make them easy to locate when pitching. The five-sided shape of the Hilleberg Tarp 5 makes it more amenable for incorporating natural elements, like trees or fallen logs, into a pitch than a four-sided rectangular or catenary cut tarp. The silnylon construction also helps because it has some stretch to it, unlike cuben fiber, which lacks the same elasticity. 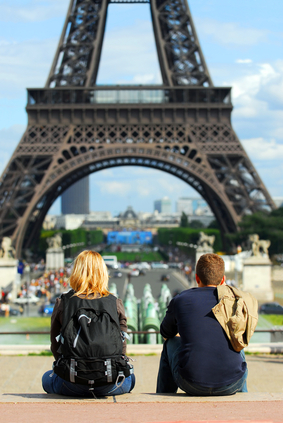 While an A-frame pitch is expedient, some people find it really boring. But it can be a lot of fun and an intellectual challenge to create tarp “shapes” that incorporate natural elements. For instance, you can use a fallen log or boulder as an extra side wall to block wind and rain, or as a heat reflector if you’ve built a fire to help keep you warmer at night. The variations possible are only limited by your imagination and your ability to recognize opportunities in the landscape. It’s actually easier to do than it sounds. Experiment. While there is a degree of symmetry in the Tarp 5, it can be used in a non-symmetrical way, depending on how you orient the guyout points. Having extra long guylines, like those included with the Tarp 5 is also helpful. You’ll have wrinkles in your pitch, but that’s not such a big deal in protected campsites that are littered with natural elements to block the wind. 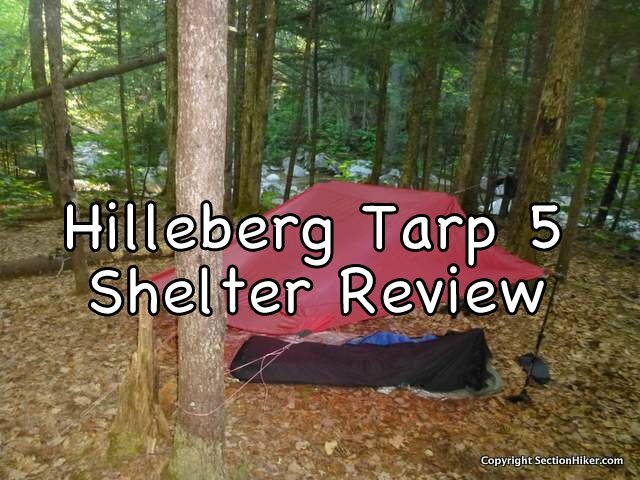 The Hilleberg Tarp 5 is an ultralight backpacking tarp designed for backpackers who want a greater connection to the outdoors than can be experienced with shelters that have walls. Lightweight but “Hilleberg” durable, the Tarp 5 has extra side panels that increase its width and comfort. While the Tarp 5 is an excellent value even if you just want to pitch it using a more conventional A-frame style configuration, its unique 5 sided construction excels when it comes to incorporating natural elements into your tarp set-up like logs or boulders. While more experienced tarp users will love this capability, the Tarp 5 is still suitable for less experienced tarp campers eager to experiment with different set-ups and who wish to increase their campsite selection and backpacking skill set.